The mission of the data services department is to provide KHA members with timely, accurate data, information and resources. There is a vast array of data tools, reports, surveys and publications available online in the KHA Data Center. The Kentucky Hospital Association Data Program is the only source for all patient-level data. This level of information is not available anywhere else, and is a priceless benefit for your analysis and planning needs. All licensed facilities are required by state law to submit claims-level data to the Kentucky Cabinet for Health and Family Services. As the approved contractor, KHA provides the KYIPOP (Kentucky Inpatient and Outpatient) system. This is an online, secure system for submission, collection and editing of these records. KHA staff ensures each facility reports accurate data, performs audits of the data and prepares the dataset. By continually improving the collection system, KHA helps reduce unnecessary duplication of data submission effort for our member facilities. Once the dataset is released, KHA provides this same dataset to all members through KHA InfoSuite, a web-based decision support tool. KHA InfoSuite allows the authorized user to filter and organize report layouts, using multiple data attributes. These saved layouts may be shared between multiple users within the same facility or system. The information is ideal for utilization analysis, planning, marketing and quality applications. KHA also uses a number of data sources for utilization, government payment and quality data to create hospital-specific reports. Reports which analyze the impact of Medicare policy and payment changes are sent to hospital CFOs as they become available. Quality-based payment reports are provided to CEOs, CFOs and CNOs. 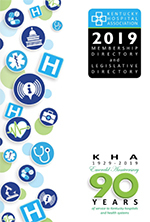 These reports have significant importance for hospitals aiming to perform optimally throughout changes in policy as well as provide meaningful information for KHA Advocacy Efforts.